'Sanctuary' is the long-awaited debut album from Magpie Diaries. The album is out now via Dashville. Check out the latest single 'Honey,' a song about preserving a simple approach to life. 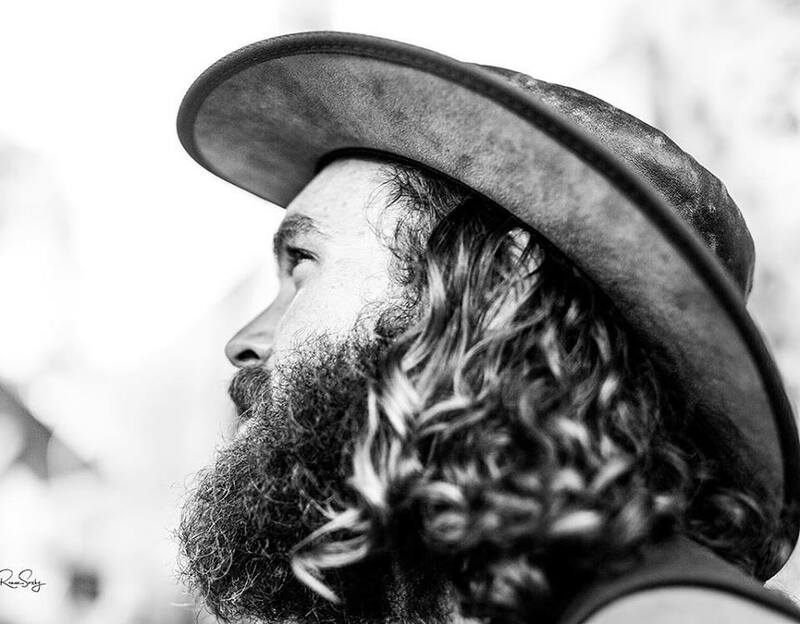 Magpie Diaries is the authentic folk musings of singer-songwriter and Dashville founder Matt "Magpie" Johnston. Alluding to an era of more simplistic notions, Magpie Diaries take flight into an abundant musical sanctuary with this 11-track debut album; a sanctuary that delivers Magpie’s story via smooth soulful folk country, with subtle flourishes of psychedelic rock 'n' roll attributed to great acts like Grateful Dead, Neil Young and Van Morrison, melded with modern influences such as Cat Power and My Morning Jacket. 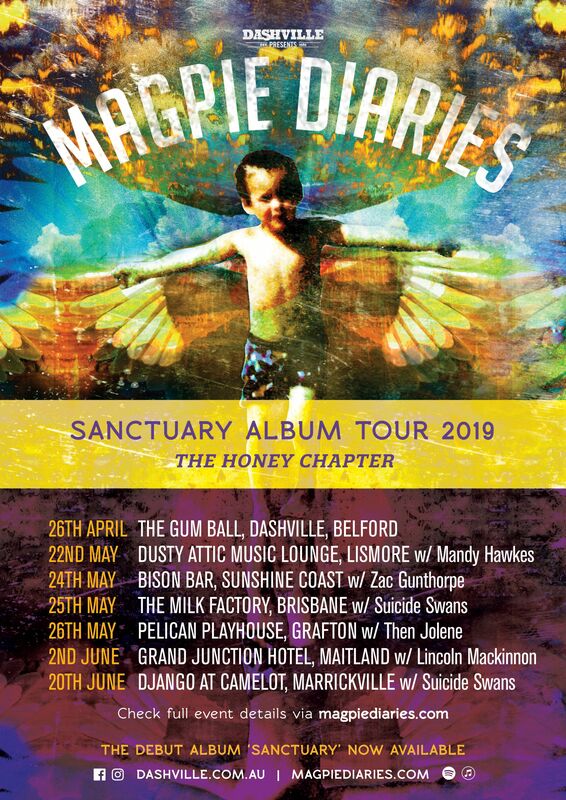 Dashville born and bred, Magpie Diaries released their debut album 'Sanctuary' to Australian audiences Nov 16th, 2018. After an extensive 32 date tour around Australia, playing alongside good friend Steve Smyth and book ended by acclaimed performances at Woodford Folk festival in Qld and Nannup Festival in WA, Hunter Valley based soul country believers, Magpie Diaries launch out with the second official single from their debut full length release. Alongside this latest single release, comes another charming video, one which paints a seemingly biographical picture of the wholesome roots of where the song comes from. For those who haven’t got their hands on a copy of the liner notes inside the vinyl record, the story of Honey comes from the mind of Magpie as he passed by an elderly man selling Honey by the side of the road outside of Singleton, one of the most heavily industrialised regions of NSW. ‘ A few years earlier I was travelling through parts of Africa and marvelling at the simple nature of people farming, making things and surviving off the land they had come to occupy. Essentially I came home and put that philosophy into play with the creation of The Gum Ball. Magpie Diaries will tour nationally throughout May-July in support of the release. Current dates announced here for QLD and NSW, with a further announcement coming soon for dates in NT, SA and VIC. Tickets are available via Dashville or the venue direct. Sanctuary is their debut album and finds them inhabiting a sweet spot right at the nexus of country, soul and psychedelia. "The monsters of the hellish day were suddenly, non-violently, given the bum's rush by a mob of brightly coloured elves whose singing and dancing and smiling was, frankly, infectious. My mind was then soothed by the far-off mating of bittersweet prairie guitars and knowing back-verandah harmonies, a saxophone soaring on the wedgetail's wing, the music propelled with carefree grace by lyrical beauty and honesty mined directly from spirits unbound. It was, as you can see, an all-time subconscious jam, detonated by one serious drink, this fluke potion with voodoo healing power. The name for this wonder came to me in a vision... I called it Magpie Diaries." The band title and songs centre around the unique mind of singer-songwriter and Dashville founder Matt ‘Magpie’ Johnston. Matt committed to being a resourceful trojan hosting music festivals in his parents front yard since 2004, had somehow acquired a working pseudonym as the Magpie, due to his nature of swooping in on anything tangible that would potentially provide service to the festival site. In the winter of 2012, after the sudden tragic passing of a close friend, Johnston began the Magpie Diaries project as a way of coming to terms with the loss. The emotional journey led him to revisit past musical escapades and written memoirs, where he pieced memories together in order to play a special solo show at his favourite pub in the world, the Junkyard. Fast forward to July 2018, together with his wife Jessica on drums and vocals, national treasure Lyle Dennis on lead guitar, Chris Dale on bass and special guest Cassie Bofinger on tenor saxophone, the band known as Magpie Diaries are excited about the prospects of touring the east coast of Australia throughout July and August in support of this first official release. It’s been a rollicking 13 years since the first Gum Ball was held, where he first stood on stage alongside his brother Dan in their teenage rock n blues outfit Johnny Real & The Lovemakers. Over the years, just as the audiences have grown, so has Magpie and his musical vocation. Through development within the all-star band the Dashville Progress Society, his brotherhood with Baghead and his beautiful drumming wife Jessica, he is slowly but surely working his way towards sharing a collection of personal music that tells his story within this crazy world. Originally Magpie Diaries was a performance concept where Magpie set out to compile and perform all his random writings amongst various books and scrap paper, from time spent travelling, under the influence or in solitary confinement in the back shack at Belford as a teenager. The songs are old soul, unique and somewhat timeless, some are new, some are about 18 years old. One thing is for sure though, a catalogue of music has begun that will appeal to anyone who enjoys laid back music from the heart. Visit here for high res and low res images, bio etc of the artist. Dashville was created by Magpie when he started The Gum Ball back in 2005, this is a story he wrote about that journey.